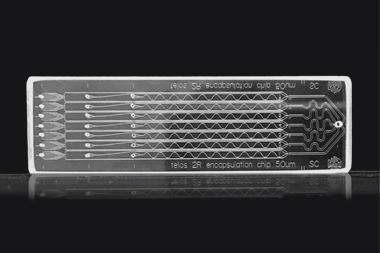 The Telos 2 Reagent Chip SC is a glass microfluidic device designed for generating monodisperse droplets containing 2 reagents. It has many applications including; emulsion generation, foam generation, micro-particle synthesis and high throughput experimentation (for example analysis of cells). SC stands for - Surface Connection. This refers to the output port which is a surface connection port rather than a chip edge connection. The Telos 2 Reagent Chip has 7 parallel junctions and can be used separately from the Telos system with the Telos Starter Kit SC. When used in conjunction with the Telos system up to 10 chips can be run in parallel (70 droplet junctions) for higher throughput applications. 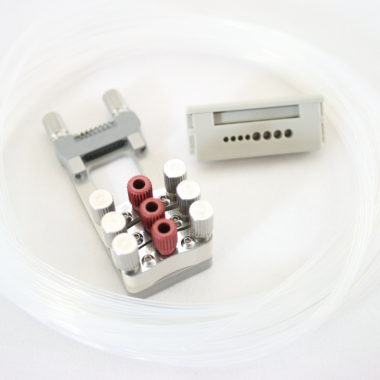 The Telos 2 Reagent Chip has 7 parallel junctions and can be used separately from the Telos system with the Telos Starter Kit SC. When used in conjunction with the Telos system up to 10 chips can be run in parallel (70 droplet junctions) for higher-throughput applications.